“If you build it, they will come.” It worked for Kevin Costner in his Iowa cornfield, but leaders of colleges and universities across the United States know that mindset is a recipe for failure. In the 21st century, where the market for students is crowded and competitive, you have to put as much work into marketing offerings as you do into building them. The first step to marketing more strategically requires you to track and leverage learner information to feed marketing campaigns. I don’t just mean students’ names and dates of birth. Every learner who comes through your door has a unique professional and academic background informing their enrollment choices. They have unique goals, academic histories, employers, preferred marketing channels and interests that all influence their decision-making. This kind of rich student intelligence makes all the difference today. Leveraging that kind of information allows marketers to be more personalized in their student outreach. What’s more, with all this information available, you can run reports to identify and target certain groups of students who would be perfectly suited to a new offering being rolled out. After all, specifically targeted marketing campaigns can drive up to 18 times more revenue than their more general counterparts. Of course, marketing doesn’t stop at outreach. You also need to make sure every touchpoint a student has with the institution—whether it’s online or in person—reinforces a positive experience and improves engagement. This means more than just personalizing outreach. You, the higher education leader of the 21st century, must ensure that your college’s digital environment is user-friendly in every way. You need to have a responsive and easy-to-navigate website that mirrors what students have come to expect from their online engagement with leading brands from Amazon to Uber. Be honest: you wouldn’t make a purchase from a store with an unprofessional online presence. By the same token, prospective learners won’t enroll at a school without a strong website. Having a website that displays properly on any device and has consistent color scheme, branding and information is critical to creating a professional and positive online experience that breeds confidence in prospective and current students. We’re not dealing with naive 17 year olds anymore. Today’s learners are experienced online shoppers and it takes a lot to stand out to them—especially as their expectations have been heightened by advances in other sectors. You need to be able to deliver customized marketing messaging that specifically addresses students’ needs, and then leverage a consistent and responsive digital experience to establish a positive impression. 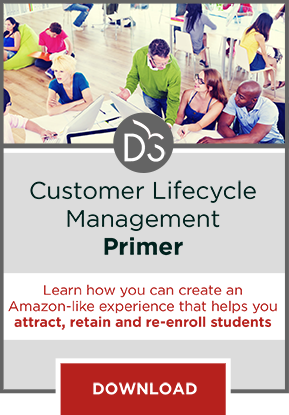 To learn how a Customer Lifecycle Management Systems can provide the rich intelligence and online environment you need to stand out to today’s learners, download this primer.